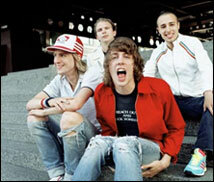 LYON, France (CelebrityAccess MediaWire) — British rock band Razorlight were forced to halt a gig in Lyon on February 4th, halfway through their set, after frontman Johnny Borrell and bassist Carl Dalemo got into an on-stage altercation. Between songs at the Ninkasi Stadium, an argument broke out between the bandmates. Words reportedly came to blows, and Borrell stormed off the stage, soon followed by the rest of the band. According to NME.com, drummer Andy Burrows returned to the stage to apologize to the crowd before leading the group back on stage to complete their set.